This is why you don’t dry your cosplay armor in the microwave. At least I’m guessing who did what because we have more of those gag credits that annoys me so as a reviewer. Jocasta finishes her medical analysis of Tony’s new heart, the mechanical organ now replacing his natural one completely. While it’s stronger it has to be charged up every now and then. Tony goes to New York to win Rumiko back and is successful. However, the Sons Of Yinsen (first introduced in a Wizard magazine minicomic special) are causing chaos in the Malaysian city of Kuala Lumpur, seeing someone in particular. Tony isn’t willing to put on his armor after what just happened to him, but Jocasta breaks out the classic armor and he flies to the city to confront the Sons. There he meets Sun-Tao, Professor Yinsen’s loyal student, who was also there when Wong-Chu forced Yinsen and Tony to work for him, leading to Yinsen’s death and the creation of the Iron Man armor. However, Yinsen secretly survived long enough to see the armor in action…and Wong-Chu survived as well! What they got right: Tony’s response to the more sophisticated armor and having his heart destroyed and replaced with a mechanical one is understandable, but he is willing to break out the classic armor so he’s not ready to give up being Iron Man. What they got wrong: I’m not against parts of the idea per say, but I haven’t seen the Wizard exclusive preview (I think it was released as part of a trade but I prefer the floppies whenever possible, except for original graphic novels) so maybe I would dislike more. 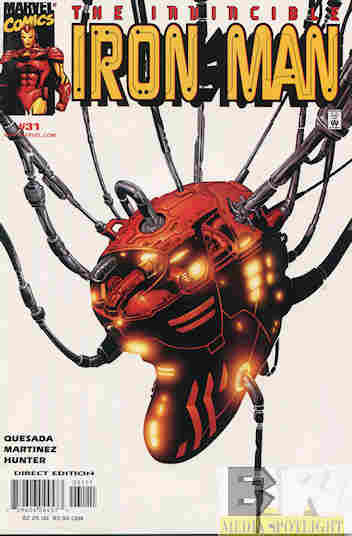 Yinsen surviving was odd enough (and this idea will get worse later), but Wong-Chu being alive, Tony going back to the classic armor, and the return of the artificial heart (less of a pacemaker this time and more of a full robotic heart) that has to be recharged just feels like Quesada is going too far back in time, regressing the series rather than pushing it forward in a positive direction. The extra insulation was also due to the armor’s electric field killing him, so using less insulation would actually be a bad idea. The art is also a bit uneven. Some panels look good, others look like its own regression to Marvel’s 90s art style. Recommendation: Honestly this one isn’t off to as good a start. While it was the storyteller in me having questions about the last arc this is more from a fan and critic’s perspective about the direction Quesada was going in. I can’t really judge until we get further in the story, a problem with the “write for the trade” style that is part of the problem with today’s comics. Posted by ShadowWing Tronix on April 16, 2019 in Marvel Spotlight, Yesterday's Comics and tagged Iron Man, Marvel Comics, Marvel Universe, Sons Of Yinsen, Tony Stark, Wong-Chu.